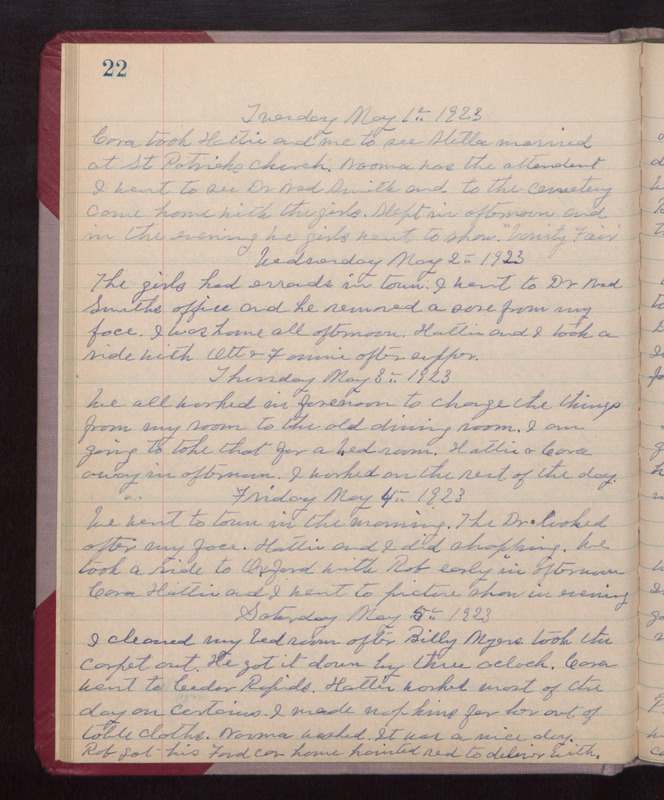 Tuesday May 1st 1923 Cora took Hattie and me to see Stella married at St Patricks Church. Norma was the attendant. I went to see Dr Ned Smith and to the cemetery. came home with the girls. Slept in afternoon and in the evening we girls went to show "Vanity Fair." Wednesday May 2nd 1923 The girls had errands in town. I went to Dr Ned Smiths office and he removed a sore from my face. I was home all afternoon. Hattie and I took a ride with Ott & Fannie after supper. Thursday May 3rd 1923 We all worked in forenoon to change the things from my room to the old dining room. I am going to take that for a bedroom. Hattie & Cora away in afternoon. I worked on the rest of the day. Friday May 4th 1923 We went to town in the morning. The Dr looked after my face. Hattie and I did shopping. We took a ride to Oxford with Rob early in afternoon. Cora, Hattie, and I went to picture show in evening. Saturday May 5th 1923 I cleaned my bedroom after Billy Myers took the carpet out. He got it down by three oclock. Cora went to Cedar Rapids. Hattie worked most of the day on curtains. I made napkins for her out of table clothes. Norma washed. It was a nice day. Rob got his Ford car home painted red to deliver with.